Mats Zuccarello and Derick Brassard, part of arguably the Rangers best line over the past few games, will look to help the Rangers take down the Maple Leafs in Toronto on Tuesday Night. Photo courtesy of Getty Images. The Rangers (30-16-5) will look to end their brief two game winless skid when they travel to Toronto to take on the Maple Leafs (23-27-4) at the Air Canada Centre in the third and final meeting between the two teams this season. With an overtime loss on Sunday, the Rangers are 3-3-1 since the All Star Break. The Rangers have dropped the first two games against the Maple Leafs this season, including a 6-3 shellacking in the home opener, and a 5-4 loss in Toronto on November 8th. In the first meeting, the Rangers saw Toronto score five goals in the second period, with Lee Stempniak, Rick Nash, and Derick Brassard all scoring in the losing effort. In the second game in Toronto, the Leafs erased a 4-3 third period deficit, scoring a total of five goals on 31 shots against Cam Talbot. 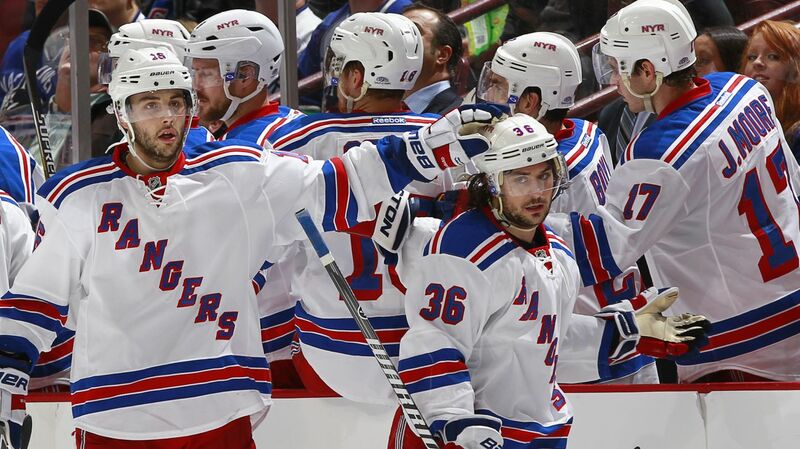 Chris Kreider and Mats Zuccarello each had a goal and an assist, with Rick Nash and Carl Hagelin each added a goal. Toronto is coming off of just their second win of 2015, ending an 11 game winless streak with a 5-1 blowout victory over the Edmonton Oilers on Saturday. Phil Kessel scored one of the five goals in the win, tying James Van Riemsdyk for the team lead in goals with 21, as well as bringing his point total to 47 (21-26-41) this season. James Reimer made 32 saves in the win, picking up his 7th win in the process. The Maple Leafs will go with the same lineup from Saturday, meaning veteran David Clarkson will be a healthy scratch for a second game, with interim coach Peter Horachek staying with the lineup that won. That also means that James Reimer will make his 19th start of the season tonight. Their captain Dion Phaneuf will not play, still dealing with a hand injury. The Rangers lost their last game against the Dallas Stars, earning a point in a 3-2 overtime loss at Madison Square Garden. New York was yet again victimized by a slow start, one that saw Alain Vigneault bench his top line due to lack of possession and production. They managed to outshoot Dallas 20-2 in the third period, and a Chris Kreider goal with 1:20 remaining in regulation sent the game into overtime. Ales Hemsky would give the Stars a win just 1:02 into overtime. Cam Talbot was making his third start in five nights, and apart from a weak second goal, played pretty well, stopping 23 of the 26 shots that he faced. For the first time in his career, Talbot will make his fourth consecutive start, and will be looking for his sixth win of the season. Talbot is 5-5-2 in 14 appearances with a 2.28 GAA, a .918 save percentage, and three shutouts. Cam Talbot will start his fourth consecutive game for the first time in his career, looking for his sixth win of the season. Photo courtesy of MSG Photos. The Rangers have not recalled anyone from Hartford despite Jesper Fast being sidelined with a right knee sprain for the next 2-3 weeks, meaning that the forwards will remain the same, with JT Miller and Lee Stempniak remaining in the lineup. Chris Kreider scored the late goal for the Rangers, and he has been red hot for a long stretch of games. 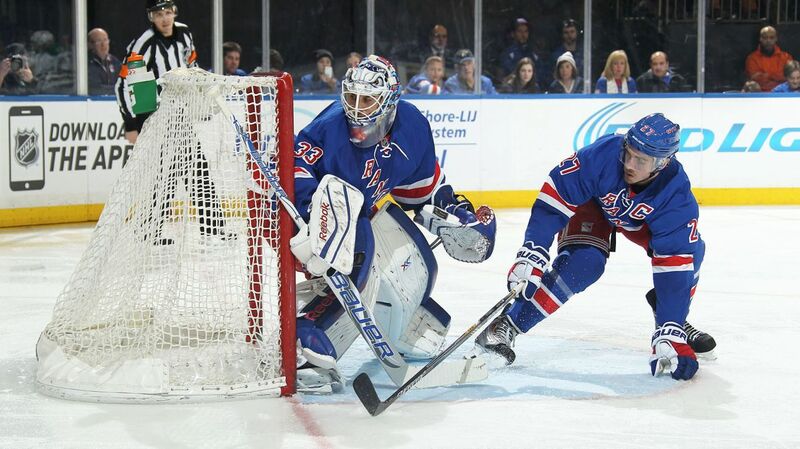 Kreider has 13 points (7-6-13) over the last 17 games, including two goals and two assists in the last five games. Kreider has done a much better job of using his speed and strength to get to the dirty areas of the ice as well as setting up plays from behind the net. Alonsgide him on the line is Mats Zuccarello, who despite not scoring as often as last season, has been setting up goals and generating offense all over the ice. He assisted on Kreider’s goal, extending his point streak to five games. 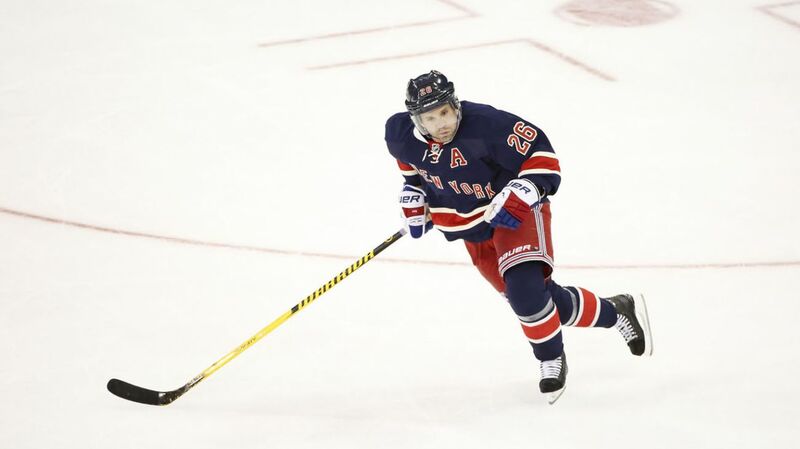 Vigneault did say that he wants to see him shoot more, and goals will come for Zuccarello. The line of Chris Kreider, Derick Brassard (four points in last four games), and Mats Zuccarello continues to have a lot of success. The absence of Martin St. Louis lately has been extremely noticeable. St. Louis is trusted to be a top scorer on the team, but has not found the back of the net in the last 12 games, and just one assist in the last seven games. St. Louis had a strong stretch early in the season, and needs another one for the Rangers to stay relevant in the division race. With Henrik Lundqvist out of the lineup, the Rangers will need a lot more production from Martin St. Louis to help the team stay afloat in the division race. Photo courtesy of MSG Photos. “You’re one good play, one good shot, away from turning it around,” said St. Louis.” I know I’m a streaky player goal-scoring wise. These are not fun times, but they are times when you find out about yourself. The only lineup change for the Rangers is on defense, with John Moore coming back into the lineup for Matt Hunwick, who played less than 11 minutes against the Stars. Tonight is the start of a four game road trip, with the first three coming against struggling teams in the Maple Leafs, Avalanche, and Arizona. This presents a good opportunity for a team looking to right the ship following the injury to Henrik Lundqvist, and instill some confidence in the team before taking on the Islanders again. The Rangers will take on the Toronto Maple Leafs at the Air Canada Centre at 7:30 PM. The game will be broadcasted on MSG Network. Posted on February 10, 2015, in Game Previews and tagged Alain Vigneault, Cam Talbot, Carl Hagelin, Chris Kreider, Dan Boyle, Dan Girardi, Derek Stepan, Derick Brassard, Dominic Moore, Henrik Lundqvist, Jesper Fast, John Moore, JT Miller, Kevin Hayes, Kevin Klein, King Henrik, Lee Stempniak, Mackenzie Skapski, Madison Square Garden, Marc Staal, Martin St. Louis, Mats Zuccarello, Matt Hunwick, MSG, MSL, New York Rangers, New York Rangers trade rumors, NHL, NHL 2014-2015 Season, NY Rangers, NYR, Rangers, Rangers Nation, Rangerstown, Rick Nash, Ryan McDonagh, Tanner Glass, The Ranger Zone. Bookmark the permalink. Leave a comment.